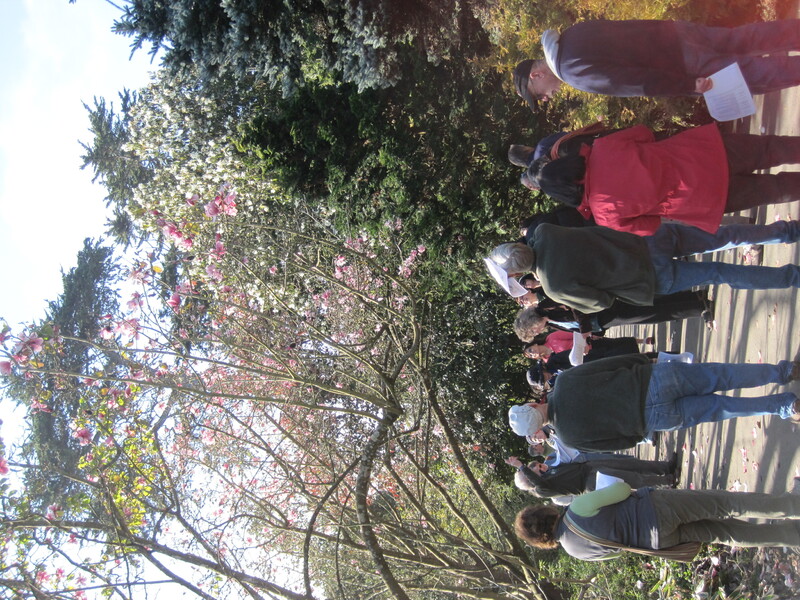 Take a magnolia walk in the San Francisco Botanical Garden in Golden Gate Park this month! Yesterday afternoon, on a docent-led tour we learned many interesting facts about the magnolias in this world-renowned collection, recently listed as the 4th best in the world (the first three being in China). Some Magnolia species are native to North and South America, but 80% come from Asia. The Asian varieties are the precocious-flowering ones, i.e. the flowers emerge before the leaves, in a Dr. Seuss-like effect featuring gnarly branches conspicuously festooned with incongruous-looking, often outsized blossoms in shades ranging from bright pink to waxy white. Magnolia is a very old genus, perhaps as old as 100 million years?! The flower is primitive by botanical standards, with sepals and petals indistinguishable from one another and therefore called “tepals.” Inside the cup of the flower a mass of stamens, bearing the pollen, surrounds a column of pistils. Beetles, a very old form of insect life (older than bees! ), have traditionally pollinated magnolias; they crawl around on the stamens, eat the pollen and munch on the tepals. Song birds eat the magnolia seeds, which are produced in cone-like fruits. The seeds and fleshy arils are a good food source for migrating birds. The name, Magnolia, honors a French physician-botanist, Pierre Magnol (1638-1715), who is credited with planting the first specimen of Magnolia in the first botanical garden in France (in Montpellier). 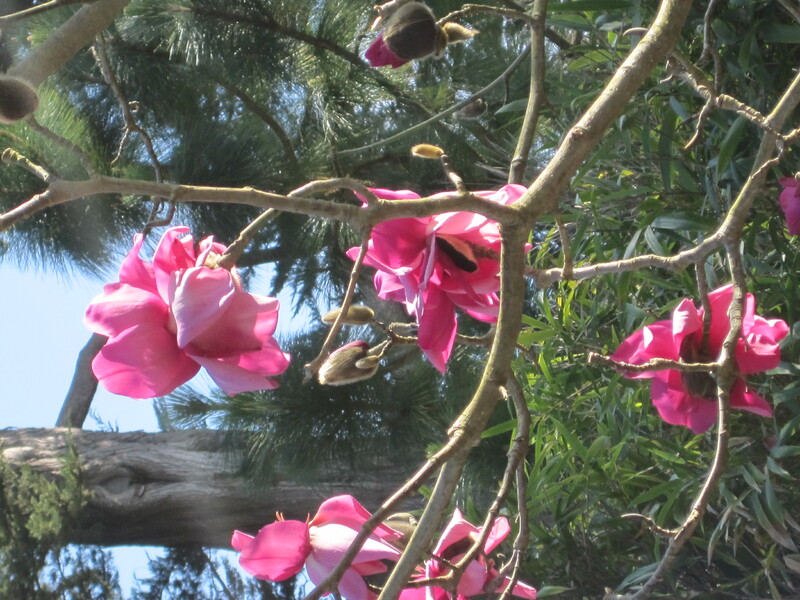 The oldest magnolias in the SFBG collection date to between 1937 and 1957, planted by Eric Walther who was then director of the arboretum. He introduced seventeen species of magnolia into the garden during his tenure. The evergreen Southern magnolia, Magnolia grandiflora, native to the southeastern United States, has dark green, glossy leaves that have a brownish, hairy underside, giving the tree a two-toned effect. 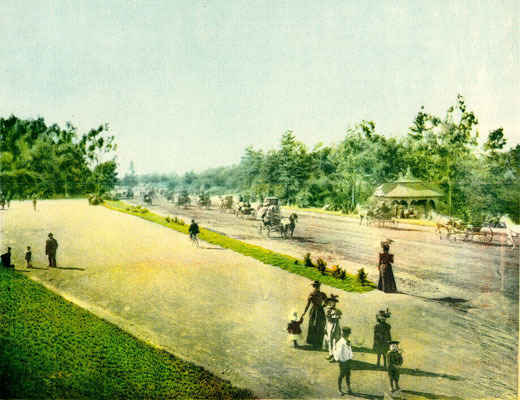 These trees can vary quite a bit in size, but some can become grand indeed, reaching as much as 90 feet in height. This is the most commonly cultivated magnolia world wide. The large, white blossoms are showy at their peak, but, to my mind, this tree is less striking in bloom than the marvelous Asian varieties in their bare-branched, precocious blooming state. This is peak viewing time for the magnolias in the park. Ask for a handout for “The Magnolia Walk” at the entrance kiosks to the SFBG, and you will receive a free map with all the magnolia locations and information about the trees’ history and characteristics. This entry was posted in plants, san francisco botanical garden, trees/urban forest. Bookmark the permalink.